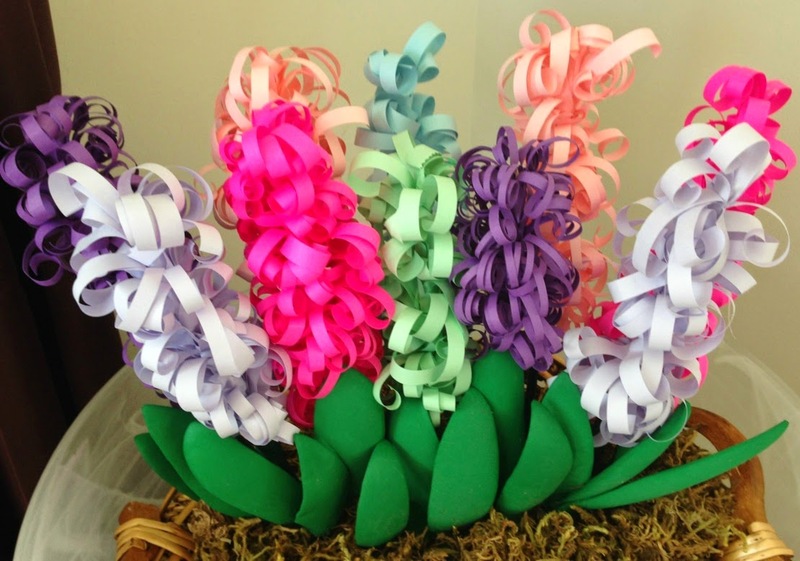 Real flowers and plants are always fabulous to have in your home, especially during the holidays and on special occasions, but if you're tired of them not lasting or being too costly to keep on a regular basis then these spring curly paper hyacinths might be a solution. And what a wonderful way to make them with your child or grandchild for an awesome Mother's Day gift. Cut 2 1/2 inch strips of colorful paper. Make vertical cuts in strips on stacked paper leaving a 1/2 inch border. Use a skewer to tightly curl the cut strips. Dab tacky glue ( hot glue is too hot for this paper and will burn your fingers) on paper end and roll onto stick. Apply glue as you roll paper to the end. You can re-roll the individual strips if needed. Apply floral tape to skewer stick. Free-hand cut leaves out of foam sheet and lay on a medium heated iron plate to curl. Hot glue leaves in front of sticks. 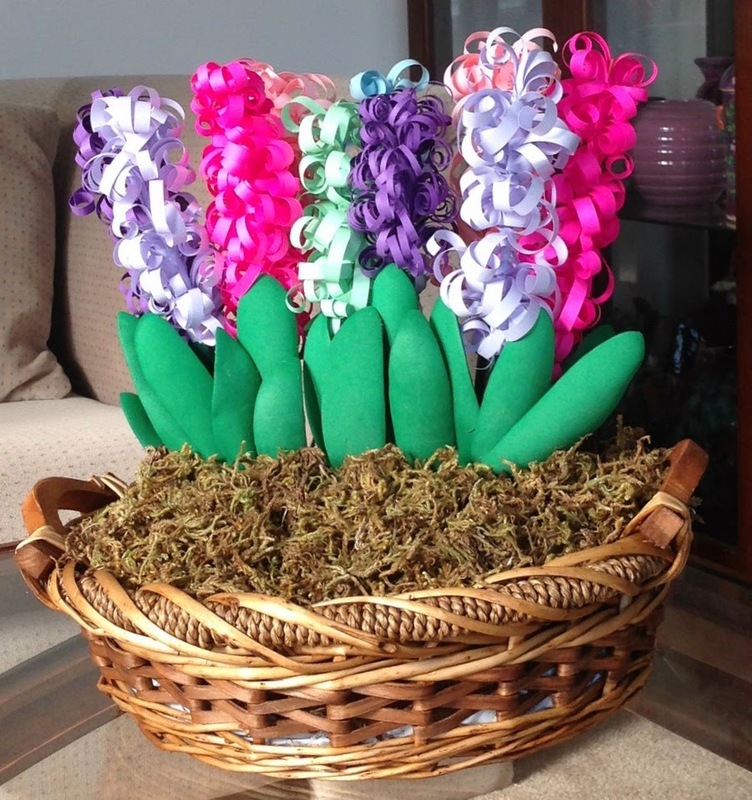 Having green leaves are an important part of the hyacinth plant. Display in your favorite container using florist foam and moss for a finish look. Create some lasting brightness and color in your decor or for your favorite someone, Mom, or just because. The best part is that they stay fresh forever! Gail, these are so pretty and unique. I've never seen anything like this. Such a fun craft idea. I hear you on the cost of flowers before the last two kids came I bought them every week now almost never but I love the paper versions but I think the foam trick is just way too cool! These are gorgeous Gail, and sooo perfect for spring. Love the colours you chose. The flowers are lovely, but I am always impressed by the tutorials you write. So clear and concise with the perfect photo showing the steps. Hi Gail! Love these! My young girls love craft projects like this. I'm a new follower on bloglovin. I want to follow you on g+, but your link on the sidebar does not go to your page. These are getting pinned right this instant - so pretty !!! 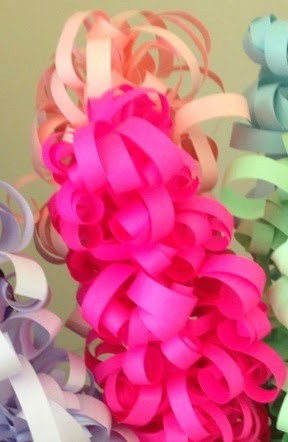 I love these paper flowers! 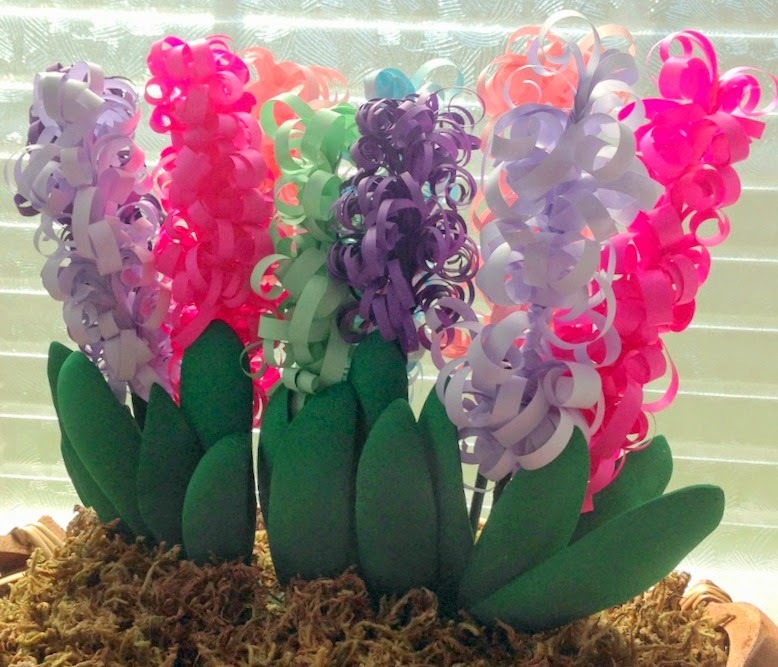 Love your paper hyacinth. What a wonderful way to bring Spring forth!